New from the experts at Keratex, Zeolite is a revolution in the way we supplement our horse’s feed. Keratex Zeolite™ is completely new to the equine market, it acts as a 100% natural detox, internally cleansing the horse’s digestive system whilst trapping the maximum amount of nutrients available in normal feeds and supplements for the benefit of the horse. For hundreds of years, this naturally occurring volcanic clay mineral ash called Zeolite has been described as nature’s best detox. 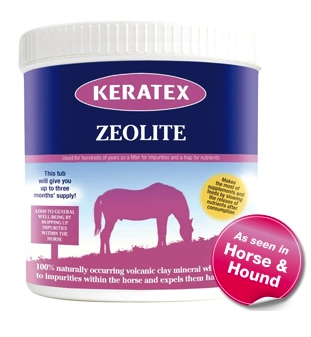 Often regarded as an internal cleansing supplement, Zeolite has been used by different civilisations through the centuries to mop-up impurities in the body and improve well-being whilst trapping unwanted toxins in its molecular filter system and expelling them harmlessly.Zeolite is now available for your horse, exclusively from the experts at Keratex, in a powdered form with a handy scoop. Mix straight into your horse’s daily feed to increase the absorption of nutrients from everyday feeds and supplements and rid the horse’s body of unwanted toxins.